Islington on the Green is a residential complex consisting of 70 modern, high-specification apartments. Based in the heart of Islington, these properties boast all the benefits of an unbeatable central Islington location, while maintaining the security of a private development with concierge. 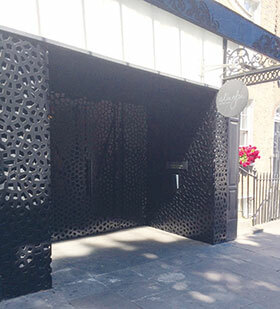 Islington on the Green required an update to its existing access control solution that had ceased to function. It also required an improved access management system that would be simple to use, and could enable the concierge and residents to grant access to visitors from the reception and their individual apartments respectively. The general manager of Islington on the Green, Ashley Proctor, approached MAS Systems to specify a new system, having previously worked with the company on a large hospitality establishment. Neil Matthews, MAS Systems’ fire and security systems manager, recommended Paxton’s Net2 Entry system, combined with the Net2 software, to meet his clients’ requirements. The new Net2 system electronically controls the main entrance to the building, as well as the private entrances to each of the 70 apartments. With the Net2 Entry monitors, residents can permit access to visitors following visual or audio verification. The concierge can easily program new access tokens for residents onsite, and cancel them from the system should any be lost or stolen, significantly increasing the level of security compared to a standard lock and key system. The Net2 system can be administered from one central PC, with external IT management able to monitor and maintain the system remotely via the network. The Net2 system, with Net2 Entry, has provided Islington on the Green with a secure access control solution that provides residents the ability to grant, or deny access to visitors and gain access themselves with a simple token. With potential plans to refit the adjacent Islington on the Green Theatre, the Net2 system also provides the opportunity to expand and secure the new site, included in the same development complex, from the same centrally managed system. • Manage and control access to the building and individual apartments. • Simple keyless entry system. • Update and improve existing access. control system. • Simple to use door entry system. • Flexible management, enabling ­property-owners and residents to control site access. • Central management with remote access capabilities. • Net2 Entry standard panel with rain hood. For more information, contact Paxton, +27 (0)21 427 6691, support@paxtonaccess.co.za, www.paxtonaccess.co.za.